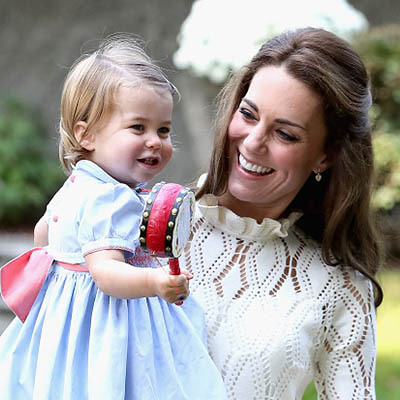 The Duchess of Cambridge may be married to the future King of England but she doesn’t often take advantage of all the jewelry opportunities that position affords. She rarely dips into the queen’s treasures the way Princess Diana once did when she transformed the vintage jewels into stylish modern accessories at almost every formal occasion. To the contrary, Kate has become much more well known for wearing affordable fashions. Well, during the royal couple’s visit to Canada the Duchess gave jewel lovers something to behold. On September 24, 2016, when she stepped off the plane with her family to greet the welcoming committee on the tarmac, the Duchess raised celebrity airport style to dazzling new heights. 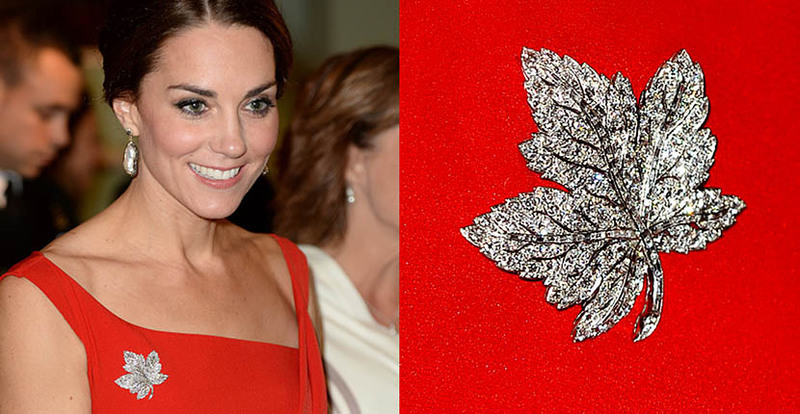 She pinned a large diamond maple leaf brooch to her beautiful blue fitted Jenny Packham dress. According to the Daily Mail the Maple Leaf jewel was given to the late Queen Mother by her husband King George IV to commemorate their 1939 trip to Canada. Round diamonds accent the leaves of the design and baguettes line up along the stem. On September 26, for the historic ceremony of reconciliation with Canadian First Nations, Kate put on the maple leaf brooch again. pinning the jewel to the asymmetrical neckline of her eye catching red Preen gown. Kate styled the jewel her way. She dressed it down a bit with pair of baroque pearl earrings by Soru set in 18K gold vermeil and sterling silver. The earrings, that were perfectly shown off because the Duchess had her hair back in a chic chignon, retail for around $100. It’s no surprise, they are sold out at the moment on the Soru website. 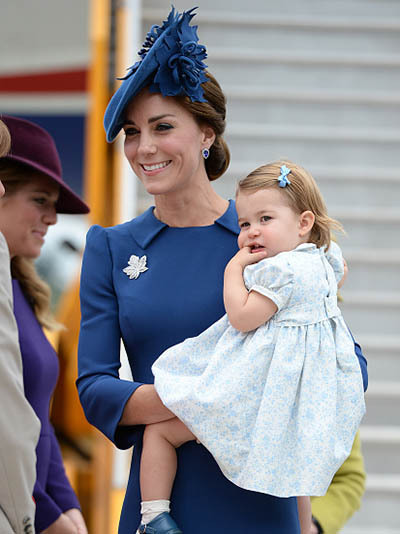 The brooch from the royal family collection, of course, is something money can’t buy. All in all, it was a priceless jewelry moment. 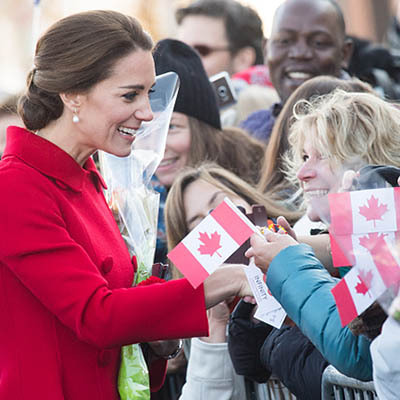 Kate continued to dip into her own jewel box—as oppose to borrowing from the Queen—for the remainder of the royal Canadian tour. On September 28th for a trip to White Horse in North West Canada’s Yukon region, she put on a pair of her favorite pearl earrings by Annoushka. Kate has worn these beautiful basics on countless occasions including the day she left the hospital with Princess Charlotte. The $1,620 jewels are composed of 18K gold, black rhodium and diamond hoops suspending baroque pearl drops. On October 29th for the children’s military party at the Government House in Canada, Kate wore a charming crème colored See by Chole dress with Lauren Yellow Gold Pave Diamond Leaf Earrings from British designer Kiki McDonough. The delightful earrings, that were inspired by British ballerina Lauren Cuthbertson, have been spotted once on the Duchess before. Since they are the drop style she loves, you can be sure we will see them on her again and again in the future.